While the Chippewa County Clerk's office allows vital records researchers access, they do not have a dedicated research area and instead allow people to use any available counter space. They allow research on Tuesdays, Wednesdays, and Thursdays, from 9:30AM till 11:30AM and then 1:30PM till 3:30PM. They have birth and death records from 1869 to the present, and marriage records from 1827, one year after the county was founded, to the present. They also have divorce and military discharge records on file. The County Clerk is on 319 Court Street in Sault Ste. Marie, MI. 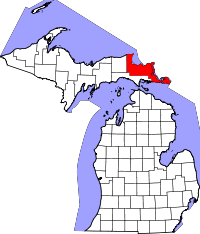 Chippewa County is one of the northern most counties in Michigan, bordering Canada. It operates the Sault Ste. Marie International Bridge which goes across Lake Superior into Ontario. The county is home to a number of national parks and refuges, including the Harbor Island National Wildlife Refuge, a 695 acre refuge accessible only by boat.